Amazed at the current state of Windows Phone 7 – piss poor but with potential. Ran across an offer for a Windows Phone the other day. $0 on a contract extension. Since I have multiple cell lines one of which was recently extended, to me it amounted to a virtually free phone. After an hour of quick research I had decided. No official instant messengers. Absolutely none. Web messengers only, like the iPhone in 2007, or sketchy third party ones. No multitasking. Cheap shot – iPhone doesn’t multitask either, and an upcoming update will introduce this feature, along with copy/paste and a much improved browser, but its a shortcoming for now. 512MB RAM tops for all Windows Phones. When multitasking does appear the phones will still have a low ceiling. There is no word from Microsoft on when a hardware refresh is coming which will include basics found on competing phones, such as dual core CPU, better screens, better graphics, more RAM, the front camera, LTE, NFC, etc. Mum is the word on that. Developer access to functionality also appears to be limited. An app can’t open TCP sockets, for example, which hinders companies like Skype from releasing a client for Windows Phone, and they’ve all but stated as much. Maybe my standards are too high and I can only play with dual core superphones right now. But at the moment you couldn’t give me a Windows Phone for free. I’ll keep my eye on it. The UI is beautiful and the platform does demonstrate a lot of form meets function design – the potential to solve several problems found in the iPhone / Android platforms is there (no UI jerk, no version fragmentation, lower limits on hardware specs, among others too long to list in this article) but has yet to be realized. I’ll tune back into WP7 in six months or so maybe. Recently Microsoft launched their latest unified messaging system – the successor of Office Communicator 2007, it features full telephony via SIP and instant messaging via Jabber/XMPP, making it capable of communicating/federating with a large number of existing open systems. The really dishy part? It comes in at around a third the price of the traditional enterprise PBX. I had been working on just such a thing myself a few months back and it’s good to see I was on the right track with where the Industry is going. Death to the telephone! Kerio MailServer, like Zimbra, has until only recently been an ‘almost but not quite’ Exchange alternative. It has offered Outlook support and integration with Active Directory since 2002, but did not initially support groupware features such as calendaring and shared contacts properly until years later. It wasn’t until 2007 that Kerio began to coalesce into an alternative to Exchange — and with the release of Kerio MailServer 6.5, its transformation into an Exchange killer is complete. I’ve saved the best for last with Kerio — I prefer it over Zimbra as an Exchange replacement for several key reasons which I’ll outline below. Kerio provides connectors for Outlook 2003 and 2007 which enable those clients, previously mentioned as irreplaceable tools for office workers, to work with Kerio as if it were Exchange itself. These connectors use the HTTP/HTTPS protocol, and as such a user can fully access their public folders and the global address list while working remotely as though they were in the office. This Outlook connector is provided at no extra charge. Mac users are able to sync to Kerio through the use of the Kerio iSync connector, also provided at no extra charge. This connector provides both addressbook and calendar sync for users of MacOS X 10.4 Tiger, and addressbook sync for Leopard users (calendar sync can be natively accomplished by Leopard’s version of iCal, so the iSync conduit is not needed for this — though it can still be used). Kerio also supports International standards such as CalDAV, enabling clients such as Apple iCal, Mozilla Sunbird, Novell Evolution and OSAF Chandler to connect with its calendar and participate fully with Windows/Outlook users. Like Zimbra, Kerio has a rich web UI though it’s patterned closely after that of Exchange. In addition to this, Kerio takes it a step further with full emulation of Outlook Web Access, which is of benefit to any third party tool or application that interfaces with Exchange via this mechanism. This opens up a larger segment of the Microsoft-entwined ecosystem to Kerio switchers than any other Exchange alternative. ActiveSync is one of the most important features of Kerio. This isn’t emulation or the implementation of similar functionality via a third party app, it’s native, true ActiveSync protocol support. That means any ActiveSync device including Palm, Windows Mobile and the iPhone can sync all their information to Kerio with “Push” (instant notification) support and GAL search. Blackberry users are also covered – an app installed on the handheld will enable push calendar/e-mail/contact synchronization without the need for a Blackberry Enterprise Server (BES). The most prominent reason I prefer Kerio is that, despite its complex functionality it maintains utmost simplicity for systems administrators. Backing up and restoring or redeploying a Kerio mailserver can be done effortlessly, even when changing the host operating system, simply by copying it’s store directory as well as a handful of configuration files to the new server and then starting it. Email, contact and calendar data are stored on the filesystem rather than being placed in a database or needing to be specially imported and indexed. The Linux version of Kerio, while officially supported only under Red Hat Enterprise, can be easily deployed on any modern distribution with little effort. This is in contrast with Zimbra which requires pretty major surgery to get running on anything other than its short list of supported distributions. Kerio integrates with both Active Directory, supporting Windows networks, and Open Directory, supporting MacOS driven networks for authentication information, relieving admins of the need to maintain a separate user database. One nice thing about Kerio is that it can join multiple Active Directories on a per-domain basis, making it possible to host multiple mailsystems and multiple Global Address Lists on a single server. If a single server is not enough, Kerio also supports clustering, and because its Linux and OS X versions support a wide range of UNIX filesystems and filesystem abstraction mechanisms, the mail spools and stores can be placed on a wide range of possible storage systems. Scalability is no problem. Kerio doesn’t come in a free version as does Zimbra, but this didn’t deter me from buying it for my own personal use. The benefits vis a vis Exchange (which I was previously using for my Calendar/Contacts/Mobile sync) were too compelling to pass up. Kerio presents itself as a drop-in Exchange replacement, requiring as little re-training on the part of users and systems administrators alike (though system administrators should always be re-training themselves, a little elegance on the software side never hurt anyone). Some research has led me to find a growing number of Hosted Microsoft Exchange providers beginning to offer Hosted Kerio as well, which is an encouraging sign that it’s being recognized for its capabilities. I hope to see Kerio, Zimbra and others continue to take the de-facto center-seat away from Exchange in as many organizations as possible. For a long time, Zimbra has been an ‘almost but not quite’ Exchange alternative – it offered the web GUI and the Outlook compatibility, but not the standards based calendar protocol (CalDAV) or the mobile device support of its big brother. Zimbra’s latest version, which has only been in the wild for a few months, is different. Zimbra provides an Outlook connector enabling Windows users to continue using the app they were trained on. All features in outlook down to shared folders and the GAL are provided. On top of this, in its latest 5.0 version, it has introduced wide ranging mobile device support, covering all major smartphones with the exception currently of the iPhone (though a web interface is provided specifically for iPhone users, this isn’t quite the same as total integration). A connector for Apple Sync Services is provided, enabling Mac users to connect the native Address Book and iCal applications to tue server with full functionality and interoperability with their Outlook using counterparts. Zimbra also advertises its mail and calendar facilities in a standard way so that a growing number of standards based clients can also access this information. CalDAV clients such as Apple iCal 3.0 (in MacOS X 10.5), Novell Evolution and Mozilla Sunbird are leading this increase in awareness of a standard calendaring protocol, and Zimbra does well to support it. Most notably, Zimbra 5.0 introduced the dealmaker: support for PalmOS and Windows Mobile smartphones via an installable application, and blackberry support via an extension to BlackBerry’s BES server. This finally puts Zimbra on the radar for corporate deployment. On top of all this, Zimbra supports largescale clustering and a massive number of clustered storage/backup options available to it due to its reliance on Linux and MacOS X as the server operating system of choice, and integration with Active Directory – IT departments everywhere will be able to work Zimbra into their infrastructure. With the 5.0 release, Zimbra Collaboration Suite meets these criteria and has become the first answer to Microsoft Exchange. In September 2007, Zimbra’s parent company was purchased by Yahoo! and Microsoft began making hostile moves toward buying out Yahoo! shortly thereafter. One has to wonder what Microsoft would have done to Yahoo!‘s Zimbra division if this had taken place – it’s unlikely Zimbra would have survived (Microsoft is famous for using phrases like “knife the baby” in its business deals). Had Yahoo! not rejected these attempts, there may not have been any alternative at all. Fortunately, Yahoo! has so far rejected all attempts at being bought by Microsoft. Let’s hope this continues, because I find it doubtful that the US DoJ would notice the destruction of a potential Exchange competitor. Stay tuned for part 3, which will cover the second of these: Kerio MailServer 6.5. For years, workgroups and corporate environments have needed a solution that combined a mailsystem with collaborative tools, like a calendar and shared contacts. For years, this solution was only provided by Microsoft in the form of Microsoft Exchange. For years, Microsoft Exchange was bar-none the best tool for this job. It supported all the features major enterprises requested, it supported all mobile devices and had an ecosystem of products and support around it that simply made it better than all the alternatives. The only problem is, Exchange is also a terrible burden. As with most Microsoft products, it’s fragile and impossible to cleanly back up and restore in the event of a disaster. As a result, it costs every organization that uses it a tremendous amount of money, and carries with it the potential of costing even more money when (not if) something goes wrong. Most organizations have stooped to multi-level replication of live data to avoid all but the remotest possibility of failure, knowing that such failure would likely be permanent. Many traditionalists will say that a mailsystem should simply deliver mail, and that features like calendaring can be added with ad-hoc plugins for small-time web applications like SquirrelMail or Horde. The rationale will continue that web based applications are the future anyway, ignoring the fact that the rising prevalence of web applications is simply due to the refusal of software makers to come together on interoperable standards. But all this is irrelevant – a mailsystem was fine in the beginning, but a real collaboration system in which users can share not only messages but information about the time they’re spending is an absolute necessity in the modern workplace. So, what does Exchange do better than the rest, specifically? Exchange users can share their mail folders with each other. They can attach to another user’s shared folder, and they can view and edit (if they have permission) the contents of public folders. In addition to maintaining an events calendar, Exchange users can view the calendars of other users on the system. They can, if they have permission, add or edit appointments in calendars belonging to others. When scheduling an appointment including others as attendees, they can see what times are best for those others in a timetable showing their ‘free/busy’ time. Exchange users are able to maintain a list of favorite contacts of their own, and can always refer to the GAL, the global address list. This list contains the contact info for everyone in their organization. The 3 items above are basic criteria. Without these most basic capabilities, nothing can be considered an Exchange alternative. Under Windows, Microsoft Outlook is the de-facto standard groupware client, and millions of knowledge workers, secretaries and other employees around the world know how to use it. If it doesn’t work with Outlook, that’s already a showstopper. Any possible alternative to Exchange Server must support this client. Under MacOS X, Microsoft Entourage is a fairly decent option. It’s not as feature-rich as Outlook, but it takes all other collaboration software on the Mac to school when it comes to calendar and folder sharing, free/busy, and global address lists (GAL). It’s the official Microsoft client for Mac. Not necessary to support, but nice-to-have. Under Linux, Novell Evolution provides a semi-capable method of accessing Exchange sometimes if it’s in the mood for it. But this is the way of all things on the Linux desktop. Once again, Mac and Linux client support is nice, but Outlook is absolutely the clincher. If it doesn’t do Outlook, the outlook for adoption isn’t so good. This device support is notable because it means there’s an entire ecosystem of software and hardware that works with Exchange Server. Any possible alternative to Exchange has to plug into as much of this ecosystem as possible. On the IT admin side of things, a replacement for Exchange server needs to support the existing network/systems that are in place. In the vast majority of cases this is going to be a Windows network backed by an Active Directory, sync servers for BlackBerry devices, backup systems and others. Because IT admins have a large amount of say when it comes to the feasibility of adopting something new, the amount of weight placed on these areas is going to make a huge difference. This is a simple, condensed list of the absolute basics needed when evaluating a replacement for Exchange. Many organizations will have other specific criteria and as such will need to do their homework when researching viable options. As mentioned and as is the purpose of this series, there are now replacements for Exchange Server – 2 of them, and both of these have appeared on the scene within the last 6 months. Though both have existed for longer, their latest versions now sport a featureset rich enough for them to have the “right stuff”, and I consider both to be drop-in replacements based on the above criteria in a large number of cases. Stay tuned for part 2, which will cover the first of these: Zimbra Collaboration Suite. Many credit Microsoft’s Mac support for saving the platform in the late 90’s. This is very true, but while they did this it’s important to keep hold of the more objective view of their Mac support. Microsoft’s motivation to support Apple in its hour of need was clear. Antitrust proceedings forced Microsoft into a corner, and the destruction of Apple would have only proven Microsoft’s nature as a monopoly force that was eradicating its competition. While Microsoft maintains a set of apps for the Mac which appear reasonable and complete, these are designed only to exhibit lack of support for crucial items. Microsoft’s current Office product for Mac does not open or save Office 2007 formatted documents, and will not until 2008, over a year after the release of the Windows version. This makes the Mac more difficult to use in workplaces and even homes where individual users are beginning to adopt Office 2007. Even Apple itself has introduced Office 2007 document support into its own applications, and indeed integrated it with its latest version of the operating system. Are we to believe Microsoft’s engineering team are incapable of doing this? Clearly one must assume this is by design. Microsoft’s Entourage mail client, part of Office for Mac, lacks crucial Exchange support such as MAPI and Global Address List, which makes it nearly useless in the corporate environment. Further, its device synchronization support with devices such as PalmOS or Windows Mobile is non-existent. One has to use third-party applications to accomplish this. Microsoft’s Entourage client also purports to synchronize its calendar and contacts with the Macintosh ‘iCal’ and ‘Address Book’ applications – however in so doing it removes all categories and other important data from the synced items, throwing a well organized calendar or address book into total disarray. Implementing this is not difficult, and has also been developed by third parties – but having to add third party apps makes no case for corporate or home use. Microsoft’s upcoming Office 2008:mac will do away with support for VBscript and Excel macros, which are crucial for use in the business environment. Many businesses now using Office for Mac in these situations will be forced to either not upgrade and face document format incompatibilities, or switch to the Windows version of Office. Microsoft Messenger, the Mac MSN client, lacks audio and video chat support. These items are so trivial to implement that 2 developers could do so in a day of work. Even Yahoo! messenger supports audio/visual chat, and one can’t say Yahoo’s Mac engineering team is as large as Microsoft’s. This is by design. Many users employ video chat to speak with friends and acquaintances, and the lack of this support in MSN on the Mac makes it highly undesirable. Microsoft has claimed that their next version of MSN Messenger for Mac will support video, but has included the crucial detail that this will be for ‘corporate users‘. I take this to mean that home users, the principal users of audio/visual chat on MSN, will still be left without. Given Microsoft Office:mac’s nonviability in the corporate environment for other reasons, this would be a highly cynical act. This is only a short list. Microsoft kneecaps their Macintosh product line in order to keep people interested in Windows, and I’m annoyed with the tech press for ignoring this issue. Back in the late 80’s and through to the mid-90’s, document format compatibility was key to getting computers to work together and getting them adopted for use, and it was very difficult. This is 2007. In a world where computers of all kinds speak to each other freely using international standards, why are we still dealing with this? One long-standing issue people have with QuickTime for Windows is its apparent insistence on becoming the default handler for video and images in IE and throughout the Windows environment, despite the setting of file associations to the contrary. Even if you set everything up to open in Windows Media, for some reason QuickTime is still invoked. This bothers a lot of people and is probably one of the reasons QuickTime for Windows is disliked. 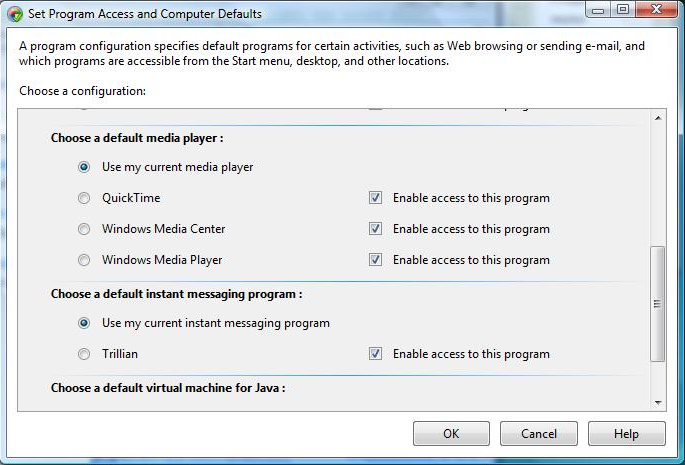 A recent discovery by an associate indicates this is a behavior of Windows’ ‘Set Program Access and Defaults’, which categorically associates web/mail/media with apps which know how to assume the default role. For some reason, Windows associates media playback to the default selection irrespective of any file associations you may have set. Screenshot included.